Yay, I'm so happy to have a couple of quilts finished already in 2015. I had a baby shower over the weekend and since I've been on a kick of giving handmade gifts, I knew I would be making baby quilts. And for baby quilts and really just a fun quilt, my go to pattern has become a plus quilt. 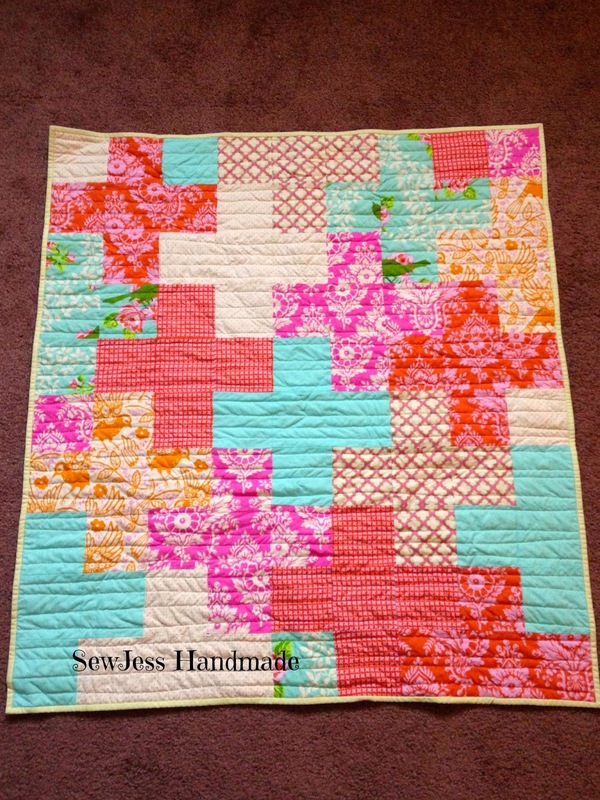 I love creating this fun patchwork quilt and it is a fun way to combine fabrics. I love the colors in this quilt. So perfect for a little girl's nursery. I used a selection of fabric from Heather Bailey's Up Parasol line, with a few blenders. The picture just can't show how vibrant the colors really are. And this is the second baby quilt for the shower over the weekend. Just perfect for a little boy. 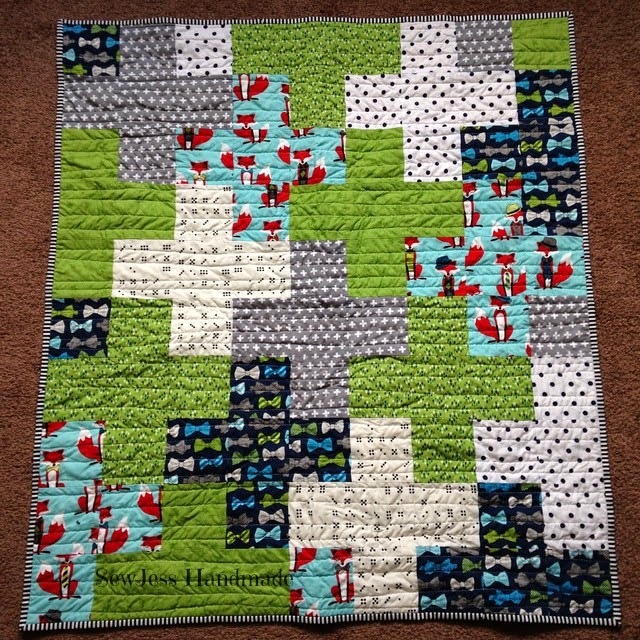 I used a few fabrics from Fox and Houndstooth by Andie Hanna and a mixture of blenders to make a perfect little quilt. For the quilting I just did some wavy lines to keep it simple, plus I do love the texture that it creates. I created this quilts with 4.5 inch squares in 10 rows of 9 for a finished size of 36 inches by 40 inches. I like to make my baby quilts just a little on the smaller size so they fit better in the crib (once baby is old enough to sleep with a blanket) and they are the perfect size for a tummy time mat. These quilts helped jump start my #SewMyStash2015, since it help clear out some fabrics that were just sitting around waiting for the perfect use. The only additional fabric I needed to purchase for these quilts was the backing and binding fabric, since I don't tend to keep large cuts of fabric in my stash for storage purposes. A great way to start off 2015!